Purnima Nath from IndiaFest speaking with Lake Effect Contributor Maayan Silver. Are you craving samosas? Do you need a place to wear a sari from your extensive collection? Or have you never eaten a samosa, and you don’t know what a sari is? Whatever category you may fall in, the organizers of IndiaFest hope you come out to its fifth annual event at Humboldt Park in Bay View on Saturday, August 19, to celebrate, learn about, and experience Indian culture. The day-long festival combines food, music, and other performances. Purnima Nath is the founder, chairwoman and president of Spindle India, Inc., which produces IndiaFest. She explains that for the first time, this year's main performance will be a show called "Bollywood Beats and Fusion," ​with renouned Indian singer Ali Pervez Mehdi and his band. "It's going to be a super fusion of modern Indian music," she explains, adding that the fest will also be showcasing local talent. She says the festival has always reflected the diversity of Indian culture as it exists in both India and Milwaukee's Indian community. "Initially we didn't have anything here in Milwaukee that represented the entire India. So the whole idea was that we would do something that gives an essence of India, it doesn't matter if someone is [from] south or north or east or west," says Nath. "This year, an interesting thing happened," she continues. "We actually worked with Nepali communities, with Bangladesh communities, as well as Sri Lanka and Pakistan. The whole idea is that they are neighboring countries, so it would be nice if they could come and enjoy as well. And the response [has been] overwhelming." 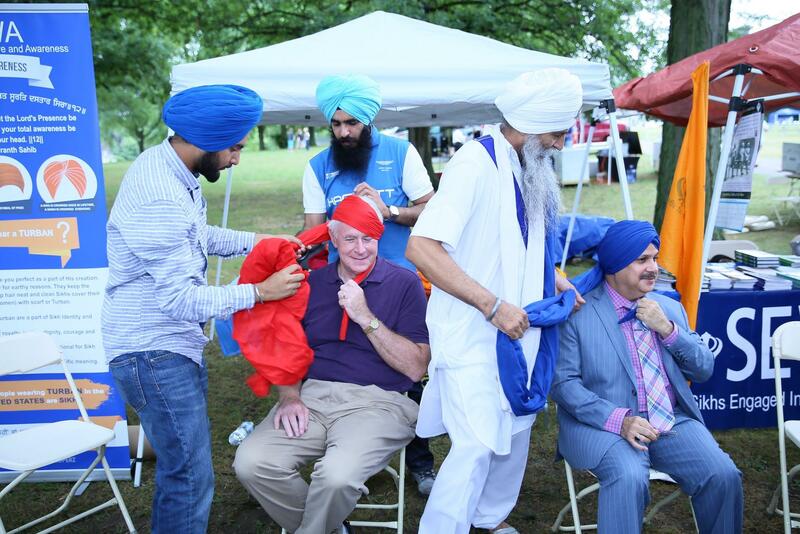 Mayor Tom Barrett participating in Sikh turban tying from a previous IndiaFest. One particular group that Milwaukeeans can look for is members of the local Sikh community, who have been involved with the festival since its beginning. "They would come and do the turban tying," she says. "It's a bit different, and it's fun. More Americans get to try it and see how it feels. How does it feel on their head, what does it mean at the end of the day...They're also going to do an exhibition as well [of Sikhs who have served in the American military.]" "My goal isn't just to grow the festival," she assesses. "My goal is also making sure that our Indian community gets more involved. There are tons of Indian people here. Not everybody is engaged... as well, as I would like to see some of our neighbors to be part of our team. They don't have to know anything about India. They just have to have that attitude and an interest." This Saturday Humboldt Park comes alive with the sights, sounds, and delicious food smells of IndiaFest Milwaukee. The day-long event is celebrating its 4th anniversary this year, and among the many honored guests attending will be the Consul General of India in Chicago, Dr. Ausaf Sayeed. As the summer comes to a close in Milwaukee, many people are hoping to squeeze out as much summertime enjoyment as possible before heading into fall. This weekend in particular, many people will be flocking to festivals such as Irish Fest or the last few days of the State Fair. However one lesser known festival hoping to make an even bigger presence than ever before is Milwaukee's third annual IndiaFest.